Since its renaissance as a retail market just over a decade ago, it has become a haven for anybody who cares about the quality and provenance of the food they eat - chefs, restaurateurs, passionate amateur cooks and people who just happen to love eating and drinking. But it’s not just the sheer quality of the food on offer that makes Borough Market special – it is also about the people and the place. The market is populated by a community of remarkable individuals from all over the UK, Europe and the rest of the world, all of whom care deeply about the food and drink on offer. Many of our stallholders are themselves producers – people who grow, rear or bake the food that they sell. Others are importers with intimate knowledge of whichever corner of the globe they source their products from. As a result, the market has become a vast repository of culinary knowledge and understanding. It’s a place to explore, to ask questions, to discover new flavours and to savour a unique atmosphere. 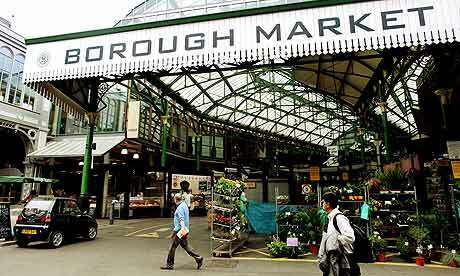 Where is Borough Market located ? On Sunday, 24 October, hundreds of customers, regular and new, turned out for Borough Market's annual Apple Day in the bustling Jubilee Market. Borough Market's Apple Day was a family celebration of the complete lifecycle of the apple and apple growers, bee-keepers and tasty pie produces were all on hand to share their knowledge and enthusiasm for all things apple. Visitors had the opportunity to sample apple varieties and products including limited edition Apple Day preserves, pies and juices from over 30 Borough Market Traders who opened up especially for Apple Day. Adding to the enjoyment was a production by The Lion's Part and interesting demonstrations from Dig 4 Victory, RSPB and Trees 4 Cities to name but a few. Borough Market Managing Director, Glenis Reagon said: "Borough Market’s Apple Day brought the rural autumn harvest into the Market’s urban setting. It was a brilliantly successful day enjoyed by hundreds of regular and new visitors to Borough Market. In addition to our Traders' usual high quality offerings, many had produced special Apple Day products which showed the enthusiasm which which they embraced this special occasion. I look forward to welcoming the visitors back to Borough Market for the exciting events we have planned over the Christmas period". Borough Market is proud to showcase young musical talent in its Jubilee Market from 1pm until 2pm on Thursday, Friday and Saturday this week as part of Youth Music Week. Organised by Youth Music, the leading UK charity which uses music to transform the lives of disadvantaged children and young people, Youth Music Week is now in its fifth year. With this week's bitter chill sweeping through Southwark, there is no better way to warm up than Hayley's warming Scotch broth made with vegetables from Borough Market's Elsey & Bent. As Borough Market is full of delicious seasonal vegetables at the moment, Hayley will serving up sizzling sausages from Rhug Estate with delicious side dishes of roasted parsnips, using honey from Sicily in London and potato cakes with kale and spring onions. For a simple yet healthy dessert why not try seasonal pureed fruits topped with Real France's crème fraiche and crunchy granola from Mini Magoo's. Hayley's cooking demonstrations take place every Thursday from 11am in the Jubilee Market. Please note that only ingredients bought in the Market on the morning of Hayley's demonstration are used; recipes are therefore subject to change. This Thursday, 14 October, Borough Market's Demo Chef Hayley will prepare a delicious Venison Stew with Chocolate & Plum Sauce using venison from Rhug Estate and vegetables from Elsey & Bent. Venison has higher levels of iron than any other red meat, and less fat than skinned chicken breast; so you can enjoy an extra portion of the devilishly decadent Chocolate and Plum Sauce! Also wafting around the Jubilee Market will be the delicious aromas of Chocolate Drizzled Bacon with Comte Cheese from the Borough Cheese Company, Chocolate with Black Pudding and Scallops and Brindisa's Chorizo served on bread from The Flour Station. Hayley will also show you how to create an aromatic Cardamon and Chocolate Sauce with spices from Spice Mountain. All chocolate used in the Demo Kitchen can be purchased from Rabot Estate located on Stoney Street. Last night, Thursday, 8 October, Borough Market was announced as the Food Market of the Year 2010 at the London Lifestyle Awards. These awards, which celebrate all that is good and great about our capital city, were announced to a host of influential industry insiders and celebrated faces. Glenis Reagon, Managing Director, Borough Market says: “Maintaining and improving the high standards which Borough Market’s customers expect requires an incredible amount of hard work from the Borough Market team. We have listened to our Traders and our customers and constantly look to improve the Market. It is important that we do not rest on our laurels and continue to develop and maintain the diversity and quality of produce available. I am delighted that Londoners have recognised Borough Market’s contribution to London and rewarded us with the Food Market of the Year Award”. Thank you to everyone who voted for Borough Market. This Thursday, 7 October our demonstration chef Hayley will be preparing an extremely seasonal butternut squash soup in the Jubilee Market. Butternut squash belongs to the cucurbita moschata family which includes the pumpkin, cucumber and courgette as fellow members. To season this warming treat, Hayley will use a selection of spices from Spice Mountain. As a wonderful partner to this soup, Hayley will be cooking some haggis and making some tasty fish cakes using haggis and fish from the Hebridean Smokehouse. Health experts recommend eating at least one serving of oily fish each week; so this is a really easy yet tasty way to make sure you are getting one of your servings! Finally, Hayley will be serving up a wonderfully warming beef stew with cinnamon that will put a smile on your face; even on a wet October day! The beef will be from Rhug Estate and she will serve it with cauliflower cheese using vegetables from Elsey & Bent and some delicious and nutritious hemp falafels from Power Falafel; Borough Market's newest Jubilee Market Trader. Please note that Hayley only uses ingredients that she has bought in the Market on the morning of her demonstration - recipes are therefore subject to change. Christmas is a hugely popular time of year at Borough Market and local choirs are invited to apply for a place to sing in the atmospheric, historic Market. School choirs, charity choirs, church choirs and community choirs are all welcome so, if you are part of a local choir, please download this application form and email to events@boroughmarket.org.uk to register your interest. Details of the Christmas carol programme will be announced on the website in November.